WAM Updates: I’m coming to WAM. Where do I park? As the Museum’s new Guest Services Manager, one of my first tasks has been to communicate Museum parking options for the thousands of people who visited WAM during Free August. We are proud to offer free parking to our guests, but during high visitation periods, spots do fill up quickly. I hope the following information will help you when you plan your next visit to WAM. 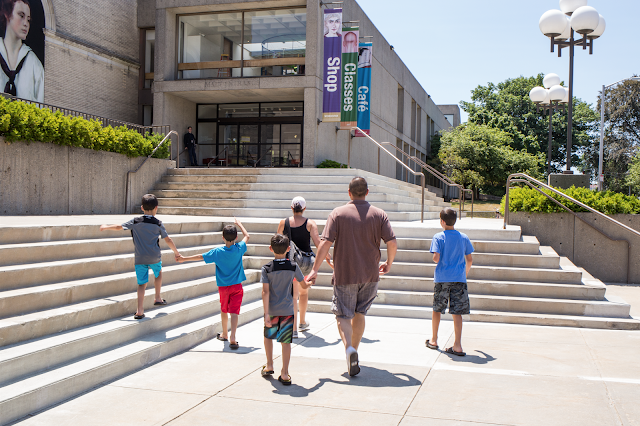 Guests have three self-parking options provided by the Museum free of charge: the Lancaster Street Lot, the Salisbury Street Lot, and the Tuckerman Street Lot. 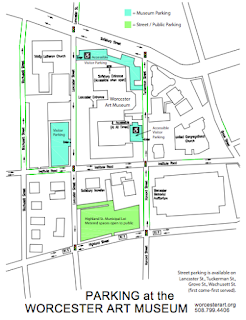 The Lancaster Street Lot offers closer parking to the Lancaster Street Entrance and the Higgins Education Wing. The Salisbury Lot is offers closer parking to the Salisbury Entrance and offers accessible parking spaces. The Tuckerman Street Lot offers closer parking to the courtyard entrance and also has accessible parking. Parking in the Museum lots are first come, first served. In addition, free street parking is available on several streets around the Museum. Metered spots are available one block away in the Highland Street Municipal Parking Lot. During school vacation weeks, community days, and other predictably busy times, we suggest taking public transportation or carpooling. If you will be driving, we recommend arriving earlier or later in the day for the best parking availability. In order to make this information more accessible to you, we have included it on our website along with a parking map. Should you have any questions regarding parking or any other issue, please dial the main number at 508-799-4406. I hope you find this information useful. I very much look forward to welcoming you to the Worcester Art Museum soon.